The story of the newest Frank Lloyd Wright building in California begins in 1923, when he developed an architectural concept for the Nakoma Clubhouse at Nakoma Country Club in Madison, Wisconsin. His design included a structure whose roofline took its inspiration from the teepee tents used primarily by the Great Plains Indians. Conical-shaped towers made of wood and copper rose from stone-clad walls. Wright's characteristic low-ceilinged entrances led into towering spaces. 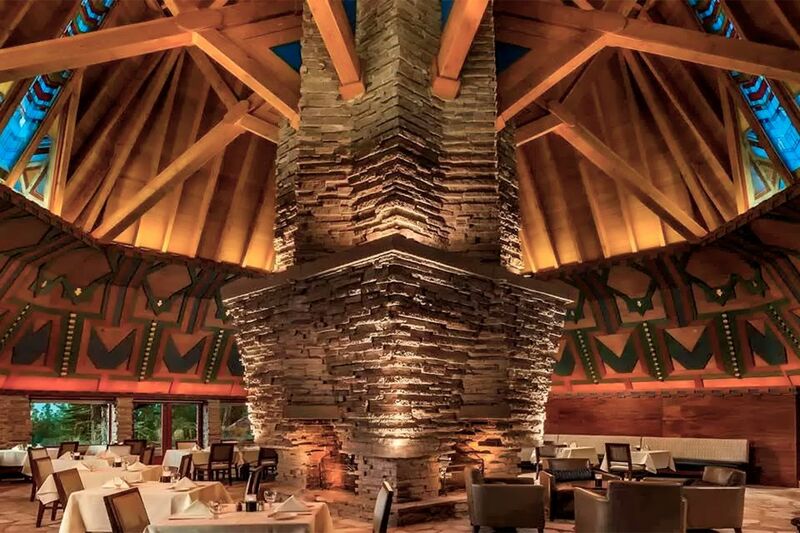 The centerpiece was the 60-foot-high Wigwam Room with a massive, four-sided central fireplace, art glass windows, and a 17-foot-high decorative frieze of abstract Indian motifs. The local newspaper, the Wisconsin State Journal called the clubhouse “the most unique building of its kind in America.” And it may have been if it had ever been built. The high price tag may have deterred the club's directors, who may have also heard of Wright's legendary cost overruns. Or it may have been rumors of scandal in Wright's personal life. Whatever their reasons, the project was not built. In 1995, Daniel and Peggy Garner bought 1,280 acres of land in Plumas County, California. Intending to build a house on it, they approached Taliesin Architects, who inherited Wright's practice. The Nakoma site much like the original Nakoma site in Wisconsin, so it's no wonder that the Taliesin staff showed the Garners Wright's plans for Nakoma. They were immediately hooked. Instead of building a house, they ended up commissioning Taliesin to created a residential community called Gold Mountain, which included not only homes but also a golf course and clubhouse, along with villas for overnight guests. As it turns out, recreating a Wright design is as difficult as renovating one of his existing structures. If the Garners had been less committed, they might have given up. It took six years to convert Wright's original drawings into modern documents, get permits and construct the buildings. The Clubhouse building is as close to Wright's original design as you can get. The only changes were made to comply with modern building codes, along with enlarging the basement and changing the allocation of interior space. The Wigwam Room is the centerpiece of the structure, built as Wright envisioned it and furnished with Wright-inspired rugs and octagonal chairs upholstered in Imperial Triangles fabric, which Wright used in the Imperial Hotel in Tokyo. It almost seems as if it were always meant to be. John Rattenbury, a Wright colleague and longtime Taliesin member thinks so. He is quoted as saying: "It's almost as if Providence had decreed that the original Wisconsin site not work out so this marvelous building could be created here." The villas at the Nakoma Resort are designed by Taliesin-trained architects Martin Newland and Elisabeth Winnen. The take their forms from the clubhouse, with octagonal shapes, pitched roofs and stone fireplaces. They are available for overnight stays. Nakoma is 60 miles northwest from the north side of Lake Tahoe and 55 miles from Reno, NV. The resort's main feature is the golf course, but you can also enjoy outdoor activities in the area. Nakoma is one of a few California Wright sites that are open to the public, although they don't give tours. You can get a list of all the Frank Lloyd Wright tours in California in this guide. It isn't the only Wright site outside California's metro areas. You'll also find several houses, a church, and a medical clinic in some of the most unexpected places. Here's where to find Wright sites in the rest of California. You can also see Wright Sites in Los Angeles and in the San Francisco area. At Lake Tahoe, you can visit Vikingsholm, which is considered one of the finest examples of Scandinavian architecture in the United States. The Tallac Historic Site is also interesting as an example of the luxurious early twentieth century resort era, with three original 1920s estates.